Here we have the production-spec images of the Tata Harrier. The rumoured pricing range of the full-grown SUV is around Rs 16 Lakhs to Rs 21 Lakhs (on-road prices). 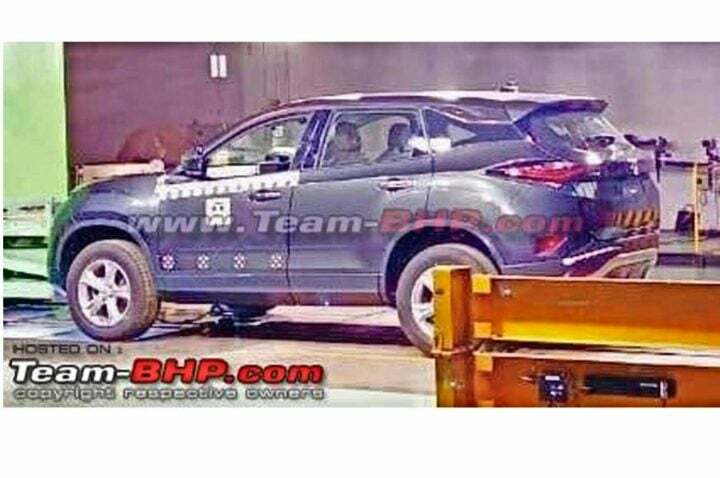 Ahead of its launch in January 2019, the production-spec of Tata Harrier (Read More) has been leaked online. There it stands without any camouflage. We can see the three-quarter rear portion of the SUV. Various reports suggest that the Harrier might be priced starting at Rs 16 Lakhs and will go up to Rs 21 Lakhs. At this price, it undercuts the Jeep Compass and is also priced aggressively against XUV 500. The SUV might be unveiled to the media next month. As we see the image, it looks very identical to the showcased model. The tires are also same as we saw in the videos and spied images. It is the first model to sport the brand’s Impact Design 2.0 Language. The SUV overall looks very dominating as well as much sporty. The Harrier gets 17-inch alloy wheels, similar to the spied models. At the rear end, it gets a silver brushed skid plate with a rear spoiler and rear washer-wiper. The rear fog lamps seem to be equipped on the rear fenders rather on the rear bumpers. The huge wraparound tail lamps seem to be LED Units. Also, we can see the flared wheel arches, identical to the showcased concept model. The Harrier gets a 2.0 Litre Kyrotec diesel engine that chunks out 140 HP and 350 Nm of torque. The engine gets a variable geometry turbocharger which reduces the turbo lag while hard acceleration. For transmission, it will use a 6-speed manual unit along with a 6-speed Automatic Unit. The safety features on the Harrier will include dual airbags, ABS, EBD, ESP, rear parking sensors and speed alert system as standard fitments. Along with these features, it might get traction control, Hill Hold and Descent control and more premium features. Since we all know about its off-roading capabilities, it might get different driving modes too. Tata Harrier will get features such as projector headlamps, LED DRLs, LED Taillights, Front and Rear foglamps on the exterior. In the interior, it might get cruise control, panoramic electric sunroof, dual-zone climate control, heated seats, and more such upscale features. As we said, the expected prices are around Rs 13.5 Lakhs to Rs 18 Lakhs (ex-showroom prices), which might go to 16 Lakhs to Rs 21 Lakhs on road. Along with XUV 500 and Jeep Compass, the mid-variants of Tata Harrier might compete with the Hyundai Creta.